How Can Any Minority Vote For Charlie Crist Knowing This? 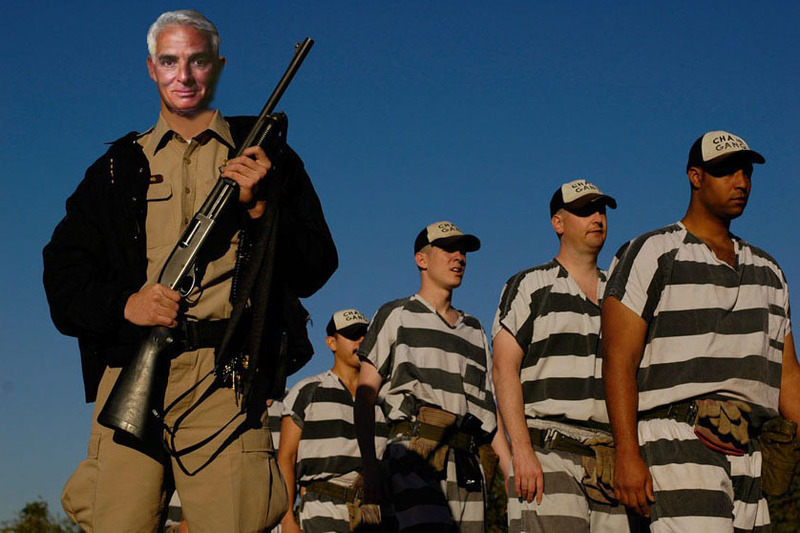 Charlie Crist has the nick-name “Chain-Gang Charlie”. Do you know why he has that nick-name? If not, let me tell you why. Charlie Crist sponsored a bill which became a law back when he was a State Senator out of St. Petersburg that went into affect in 1995. The law required groups of prisoners to be shackled to each other while doing hard labor, like in slavery days. This law was patterned after chain-gang laws in Arizona and Alabama. Yes, I said chain-gangs, you know, the practice of putting prison inmates in leg irons to work on roadsides under armed guard. But unlike Alabama, which chains the inmates together in lines of five, Florida’s work crews were supposed to be shackled, but not in groups. That is the way Arizona did it, and it was the method that the Florida Corrections Secretary at the time, Harry K. Singletary Jr., deemed would get the most work out of inmates. The correction officials also thought it would be safer for the inmates to not be shackled together, like they used to be during slavery days. In fact, the Department of Corrections did NOT want to go back to using chain-gangs for inmates, but good ole Charlie Crist insisted. He WANTED the inmates shackled together because he wanted them PUNISHED. Not that being IN prison wasn’t punishment enough. He wanted them embarrassed, humiliated, and shackled together like animals. This is the type of behavior that was done during SLAVERY days. We have groups such as the Dream Defenders organizing and trying to make things better for minorities who are receiving this same type of treatment today. individual chains would pose a higher safety risk because they would not prevent an inmate from jumping into the back of a car to escape and they made the punishment less harsh. Individual shackles made the punishment LESS HARSH! 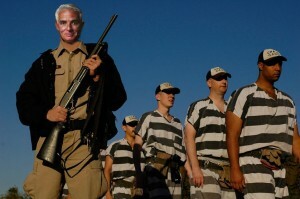 Charlie Crist felt like these prisoners needed to not only be punished, but humiliated. The same Charlie Crist who is now insisting that he left the Republican party because they are anti-minority. What does insisting on inmates, predominantly minority, being shackled like slaves and made to work that way on the side of the road, even though prison officials, who know more about it, didn’t think that was appropriate?? Chain Gangs had been abandoned in Florida since 1940. It was Charlie Crist who wanted to bring them back. It was Charlie Crist who sponsored the bill that became law. Now this same Charlie Crist, because the Democratic Party is his last hope for getting back into the political game and it carries with it the minority vote, is condemning someone else for being anti-minority? Stand Your Ground is alive and well in Florida. It is mentalities like the one that brought back chain-gangs that is allowing this law not only to stand, but to be expanded. That is the mentality of Charlie Crist, no matter what he says. Actions speak much more loudly than words. Florida inmates in chain gangs were divided into squads, each with up to 30 prisoners, and assigned eight-hour shifts in cleanup projects like removing sludge or clearing land for farming. Each squad was supervised by three correction officers, two armed with several weapons, including shotguns, 9-millimeter pistols and pepper mace. Charlie Crist. Mr. “I couldn’t take the anti-minority” shenanigans of the Republican Party. If you believe this new, convenient political maneuver of his, over his sponsorship and subsequent implementation of chain-gangs, something is seriously wrong. The original article was in The New York Times, where I discovered the true meaning of chain-gang Charlie. 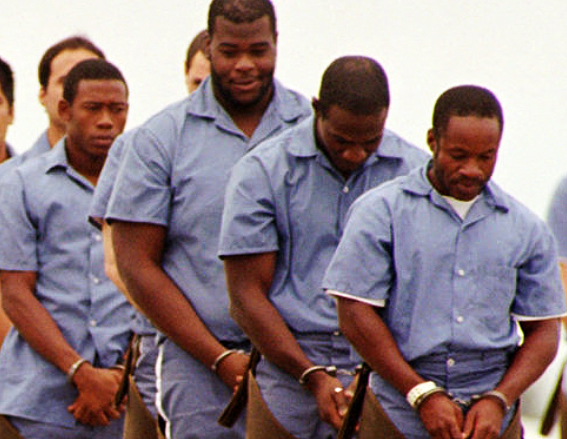 the NYT covered the implementation of the Charlie Crist sponsored chain gang law in 1995. As I stated earlier, I don’t see how ANY minority could vote for Charlie Crist. Charlie Crist bragged about being called “Chain Gang Charlie” as recently as 2009 in his race for the Republican nomination for US Senate, in which he said he couldn’t get more Right than that. So when did his revelation occur? After he lost! Read for yourself here. “I think it’s kind of funny, to be honest with you,” Crist answered. “I’m an anti-tax, pro-life, pro-gun Republican, and I think it’s very clear that during my entire career I’ve never voted for a new tax. I know African-Americans and other minorities typically fall in line with the Democratic Party, but not when that line is a Chain-Gang!! This is not something that has any good to the outcome. Mr. Crist along with all of the other bad politicians should be shackled together to exchange more bad ideas and cruelty and this way the public could identify all the demons in one group. The chain gang would not work today unless you shackle together all of the child molesters and abusers and let them abuse one another. Other than that he is a fool! !